The 1890 City Directory lists 107 S. 2nd as F. C. Bonfils Real Estate with residence on 2nd floor. Son of a Missouri Judge and descendant of Napoleon, he was 28 when he joined the Land Run of 1889. A colorful con man and lottery promoter, he had but one intention - - to make money for Bonfils. 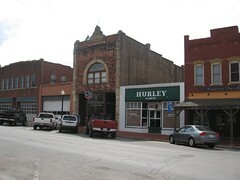 His confidence games forced him to leave town after constructing this first native stone business building in Guthrie. Among his schemes was selling town lots in Oklahoma City at bargain prices - - but they were in Oklahoma City, Texas, not Oklahoma, as most supposed. Bonfils was also involved in a "money-making machine" which duped early settlers into believing the machine actually made large bills from small ones. He later went to Denver and was co-founder of the Denver Post newspaper. He died 1932, a wealthy and nationally influential figure.